This article if the first #Clinic_All project. It’s the result of team working on Twitter to develop something useful for clinicians in practice. Please follow all these wonderful people that have helped!.. @DerekGriffin86 @PdKirwan @Seth0Neill @DrPeteMalliaras @DrAiLynTan @PhysioJack @Peter_Gettings @function2fitnes @AngeloCacchio and @unitedphysio. Apologies if I’ve missed anyone! It’s also included online resources from rheumatology.org.uk, spondylitis.org and Medscape which have all been a great help. This is very much an ‘evolving piece’ my hope is it will be updated alongside emerging evidence. If you’d like to see how Twitter was used for this project see hashtags #TendonQ and #Clinic_All. Thanks to everyone for their input so far!! Management of tendinopathy has made great progress in recent years. Advances in research have improved our treatment options and our understanding of pathology. Despite this there are many who don’t respond well to current treatments and struggle with ongoing symptoms. This piece and its accompanying questionnaire (TendonQ) are to help clinicians identify other conditions that may be driving the tendinopathy and/ or slowing the progress made with rehab. It highlights how a thorough biopsychosocial approach is needed, especially in more complex cases. When we think of tendinopathy we frequently think of a tendon responding to excess load, indeed this is often the classic history but other drivers need to be ruled out too. Tendinopathy can be a feature of rheumatological disease such as Spondyloarthropathy (e.g. Psoriatic Arthritis and Ankylosing Spondylitis) Rheumatoid Arthritis (RA) and Gout (Scott et al. 2015). Such conditions usually present with systemic symptoms including early morning stiffness, joint pain and swelling. Presentation of peripheral spondyloarthropathy can vary considerably from asymmetric, with only a few joints involved (pauciarticular) to predominant DIP joint involvement (typically associated with nail changes in Psoriatic Arthritis – see image below) to polyarticular symmetric arthritis which may appear similar to RA. Pain around the lower back, SIJ and buttock area. Alternating buttock pain. It should be noted these criteria were developed with patients with chronic back pain (of more than 3 months) and are less applicable to the acute pain population. The Irish Society for Rheumatology developed this AS screen form which can be useful for suspected AS. Psoriatic Arthritis (PsA) is a spondyolarthropathy usually linked to the skin condition psoriasis which typically presents as red, flaky patches of skin. The Psoriasis Foundation suggests that around 30% of those with psoriasis will go on to develop PsA. Those with nail changes (see below) are more likely to develop inflammatory joint symptoms so if you identify thickening, whitening or pitting of the nails it should raise your index of suspicion. The British Association of Dermatologists developed this assessment form for suspected PsA. I have a history of psoriasis, nail changes, joint pain (albeit very mild) and proximal hamstring tendinopathy which has prompted me to see a rheumalogist (more on that here). Rheumatoid Arthritis (RA) is a separate disease entity from the spondyloarthropathies. It’s characterised by symmetrical polyarticular joint inflammation, commonly affecting the metacarpophalangeal, proximal interphalangeal and metatarsophalangeal joints as well as the wrist and knees. Morning stiffness in and around the joint lasting at least an hour is a typical sign of RA (Grassi et al. 1998). Extra-articular features can include fatigue, feveret (slight fever), weight loss and malaise. RA can have significant effects on the tendon and tendon sheath. Tendinopathy of the wrist extensors is common and can lead to rupture (McQueen et al. 2005). A further consideration with RA is what medication a patient may take. Some may have been on long term steroids which will influence the tendon as discussed in the medication section below. “Gout is a crystal arthropathy, now that is not a very easy condition to understand, so I use this example, which was given to me by a Rheumatology consultant I work with. Think of it similarly to a cup of tea with sugar being put in it, sugar is a crystal, and as you put sugar in to the cup of tea, the sugar dissolves in the tea, but if you keep adding sugar to the tea, eventually you will get to a point where no more sugar can be dissolved in the tea, the tea is supersaturated, and the sugar crystals deposit at the bottom of the cup. One final point, load can still play a large role, even within inflammatory conditions. An increase in tendon symptoms may follow an increase in loading, equally they may also be linked to a flare in the underlying rheumatological condition. Role of TendonQ – the questionnaire is designed to identify key signs and symptoms of inflammatory joint disease including peripheral or axial spondyloarthropathy. In addition is screens for common extra-articular and peri-articular features detailed above. The aim is not to suggest the form makes any type of diagnosis! It simply helps your reasoning process by identifying (or excluding) specific symptoms. Diagnosis of inflammatory conditions is complex and requires specialist input and appropriate investigations. Action points – if you suspect an inflammatory joint disease seek a referral to a rheumatologist, usually this can be arranged via the GP. In addition, requesting a full blood count including inflammatory markers (ESR, CRP etc) HLA B27 and liver function tests can be helpful too. If you can already have the results of these tests prior to seeing a rheumatologist it can save time and help in the diagnostic process. Fluoroquinolones anti-biotics (including ciprofloxacin and levofloxacin) may cause tendinopathy. Symptoms usually develop acutely after taking the medication (median duration 8 days), patients over 60 are at greater risk and approximately 40% of those affecting the achilles tendon lead to complete rupture (Scott et al. 2015). Statins – patients commonly report muscle pain in association with statins but around 2% may develop tendinopathy (Scott et al. 2015). However a recent review (Teichtahl et al. 2016) has suggested some statins may be protective against the development of tendinopathy so there is some debate over their exact role. Steroids – corticosteroids can impair collage synthesis and reduce the sensile strength of a tendon (Scott et al. 2015). Long term use of steroids may increase risk of rupture, especially following tendon injection. Action points – history of taking any of the medications above should make us mindful that an increased rupture risk may be present. A more careful, slower progression of loading should be considered. In addition the psychosocial influence of these medications may be a factor. Some patients may have been told, for example, that fluoroquinolones increase risk of rupture and this may create fear of loading that needs to be addressed with careful reassurance. This is based, for the most part, on excellent recent work by Scott et al. (2015) referenced above. Age – increasing age is associated with reduced tendon strength although this may be counteracted with exercise (Svensson et al. 2016 In Press). Peri-menopause – hormonal changes around the menopause, especially loss of oestrogen, are thought to have a negative effect on tendon homeostasis (Hansen et al. 2009). Thyroid dysfunction – thyroid hormones can influence tendon homeostasis and collagen synthesis but their exact role in tendinopathy is not yet fully understood. Olivia et al. (2013) discuss this complex topic in a little more detail (thanks @AngeloCacchio for recommending this paper!). Diabetes – A systematic review by Ranger et al. (2015) reported there was strong evidence that diabetes is associated with a higher risk of tendinopathy. The role of TendonQ – to identify any relevant factors that may influence the tendon’s ability to manage load or adapt to it. Action points – If these factors are identified we should consider a more gradual progression of loading. Some factors might be changeable e.g. Smoking and weight. MDT working with the patient’s GP may help ensure peri-menopausal changes, thyroid dysfunction and diabetes are managed optimally. In addition a lipid profile may be useful if indicated. I think it’s fair to say that current management of tendinopathy is quite ’tissue focussed’. The consensus at present appears to be a structured and progressive loading programme to improve the load capacity of the tendon and kinetic chain. Little research has focussed on psychosocial factors but they can be key in managing tendinopathy. A growing body of evidence suggests stress may have an impact on healing (Alford 2006) and strength gains and recovery from resistance training (Bartholomew et al. 2008, Stults-Kolehmainen et al. 2007). I’m not aware of any studies specifically on tendons but it certainly seems plausible that stress could be a significant barrier to rehab and may impact tendon adaptation. Anxiety and depression have also been found to influence pain and coping strategies (Gerrits et al. 2015) and could also be an important factor in tendon pain. Lack of sleep may influence pain (Finan et al. 2013) and has been linked with increased injury risk (in adolescent athletes – Milewski et al. 2014) and impaired performance in athletes (Marshall and Turner 2016). Recent research (Forsdyke et al. 2016) has highlighted that how we think, feel and behave will influence the outcome of rehab following sports injury. A positive perception of return to sport has also been associated with a greater likelihood or returning to a pre-injury level of sport (Ardern et al. 2013). While work specific to tendons is sparse in this area emerging evidence suggests it could play an important role. Green et al. (abstract only) examined adherence to the Alfredson eccentric exercise programme. They identified that negative beliefs about the condition and fear of tendon rupture could reduce exercise adherence. It’s important to note that this is a small and, to date, unpublished study of just 5 patients but it may provide some indication of the impact of beliefs on rehab. Role of TendonQ – to identify any previous history of mental health and provide a picture of current mental wellbeing and psychosocial factors that could influence rehab. Action points – the questionnaire may provide clues to psychosocial factors but a more in-depth discussion of identified areas is warranted for each patient. This allows us to guide the patient on making lifestyle changes, educate and reassure where needed and involve other members of the MDT as required. TendonQ can be downloaded for free via this Dropbox link. It fits on one sheet of A4 paper and can simply be printed and given to the patient. It seems to work well to do this after the initial assessment when you have reached a diagnosis of tendon pain. The patient can then bring it to the next session so you have the information available early in the rehab process to guide treatment. It’s helpful to quickly explain the point of the questionnaire to the patient so they understand why they’re being asked so many questions! For more information about the treatment of tendinopathy and other common running injuries book on the Running Repairs Course. At time of writing we have places remaining on our Surrey and Central London courses. TendonQ is the first of a number of projects designed to help therapists and health professionals in clinic. 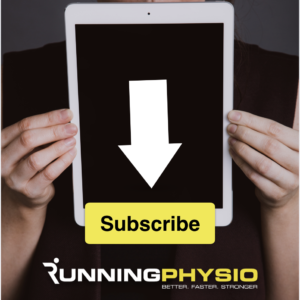 Subsribe below to be kept up to date with these developments and all new content on RunningPhysio. Thanks ever so much for compiling such excellent piece of work. May I ask whether there is ref as to the relationship between gout and tendons? and how it might affect prognosis?